Peoria Bergan High School "Trojans"
Peoria (population: 113,000) is located in central Illinois along the Illinois River, and is deep in history. The community was once the home of the Peoria Indians, who were part of the Algonquin tribe, and were part of the Illinois Confederacy with the Tamaroa, Kaskaskia, Michigamea, and Cahokia tribes. French explorers Louis Jolliet and Father Jacques Marquette were the first Europeans to come thru the area in 1673 as the French took over control of the land. That would change in 1765 when the British gained control after victory over the French in the French & Indian War. However, that would be short-lived as George Rogers Clark would claim the area for the state of Virginia in 1778. The community began to take shape and grew as the country would go westward in the 19th century. Peoria would be incorporated as a town in 1835, then repeat the process as a city ten years later. Interstate 74 is the major route in the area, with Interstate 474 being a bypass for those who wish to go around the city. Other routes include US 24 & 150, in addition to Illinois 6, 8, 29, 40, 91, and 116. Rail service is offered by ten different carriers, including BNSF, Canadian National, Norfolk Southern, and Union Pacific. Peoria's history with Roman Catholic education is also important to its history as nuns from the Sisters of St. Joseph of Carondelet in St. Louis made the trek to Peoria in 1863. Other orders would also come to the community, such as the LaSalleans from the Christian Brothers Community, and have stayed to educate Peoria's youth. 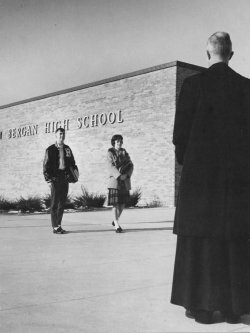 Bergan was formed in 1963 when the Catholic Diocese of Peoria decided to open up a school in the northern part of the city where the population was growing along with new churches were opening. 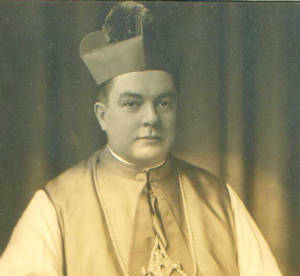 Under the leadership of Bishop John B. Franz, Bergan was named for Peoria native and the Archbishop of Omaha, Nebraska at the time, Gerald T. Bergan. The school was a co-ed operation as compared to established schools Academy of Our Lady and Spalding Institute, which were single-gender only. "Originally, Bergan was opened as a school for men and women, but it was not co-educational. Separate classes were held for men and women in separate wings of the school. Only the lunch area ("The Commons"), Chapel, Auditorium, and Library were shared during the school day. become too "liberal" in their educational style. Fr. Ken Marchelones was the first principal after the Diocese took over operational management of the school. Robert Cleary, a parapelegic, was named principal for in 1983 and served in that capacity for many years following. The Benedictine sisters made up part of the staff during my years. Later the Sister's left and the convent was closed and converted to other use." Enrollment at Peoria Bergan was 723 in 1980. The school thrived until 1988 when it was decided that due to declining enrollment (587 that year) to merge Bergan and Academy of Our Lady/Spalding together. The new school is now known as Notre Dame and uses the Bergan campus as its home base. School song: "Hey Look Us Over, We're Bergan High"
sung to "Hey Look Us Over"
We'll fight with all our might! We're the Trojans of Bergan High! Peoria Bergan was a competitive school, as it was a member of the Mid-State Conference with other Peoria-area schools such as Woodruff, Central, Manual, Richwoods, Academy of Our Lady/Spalding, Pekin, East Peoria, and Bartonville Limestone being on the Bergan schedules. The Trojans offered baseball, basketball, cross-country, football, golf, soccer, tennis, track & field, and wrestling to the boys, and girls could compete in basketball, cross-country, golf, soccer, tennis, track & field, volleyball. There is no record of a swimming team for either boys or girls, and no softball at Bergan according to the IHSA website (www.ihsa.org), although we do welcome any information someone might have. Let's start with a bang with this notable sport in Bergan history. Three was a magic number for the Bergan girls track team. In addition to making its name noteworthy, the Lady Trojans won three state Class A titles in succession under three different coaches, and having three relays along with three individuals come home with gold medals for winning their events. Suzy Tuffey won four titles in establishing herself as one of the best distance runners in state history. She still holds the state records for the 1600 (4:46.5) and 3200 (10:03.0) as of March 2007. Tuffey also has the third fastest two-mile time in prep indoor track history at 10:05.15, set in 1985. INCREDIBLE JOB BY THE LADY TROJAN TRACKSTERS!!! Bergan was known as one of the top boys’ cross-country teams in the state during the 1980’s, gathering two state championships, a second, and a sixth place finish in four consecutive seasons under coach Mike Sullivan. In addition, six harriers gained all-state honors by placing in the top 25 at the finish line. During the 1980’s, the Trojans brought home some hardware from the ball diamonds of Central Illinois, winning five Class A regionals, two sectionals, and having two appearances at the state finals in Springfield. The Trojans had their share of success, including a second-place finish at the state class A tournament under Rudy Keeling, who would go on to be head coach at the University of Maine. The best seasons in Bergan history are listed below. 1973 Peoria (Bergan) 61 vs. Macomb. In the first year of the girls’ state tournament, Bergan was represented at the finals by Dotti McLaughlin, who nearly took top medalist honors from Bloomington’s Ann Atwood. Bergan was involved in the first IHSA state meet and without having a singles or doubles entry even finish in the top eight of the state, they still had enough points to finish in the top 10, tied with two other schools. The Lady Trojans also sent three other teams to state after winning either a district or sectional championship. The Trojans were active on the cinder tracks and competed with some of the best in the state. In fact, the boys’ team came home with a fourth place finish at the state Class A meet in 1984, led by event winners Kevin Jakopin and John Stein. Before Peoria Notre Dame was formed and became a perennial favorite to win a state title, the Bergan program was already laying the cornerstone of a perennial powerhouse into place which would help Notre Dame get to the position they were in the 1990’s and early 2000’s. The Trojans went out with a bang in 1987. That season, Bergan set the IHSA state record for fewest goals allowed in one season at seven. It has since been tied by Quincy Notre Dame’s 1994 squad. The Trojans also had nine consecutive shutouts during the season, which is tied for tenth best in a single season on the IHSA list. Mark Alaksiewicz shined in goal that season, allowing seven goals and recording 14 shutouts. There were an number of successes in the boys’ golf program at Bergan as four teams finished with top 10 finishes at the state finals, and eight players placed high on the medalist’s list for individual honors, including Marty Best & Dan Kaulauski, who finished twice inside the the top 15 . The Lady Trojans were able to take on all comers in the Peoria area, and won a Class A Regional before the school merged with Academy of Our Lady (AOL)/Spalding in 1988 . We are missing the win-loss record as well as the name of the head coach of this plaque-winner. Bergan’s girls were able to run in the fall with some success, and kept track athletes busy in preparing for their spring sport. One team came away with a regional title in the school’s final year of operation. If you know more about this team or program, please contact us. Peoria Bergan played among all the schools in the city of Peoria in the MidState 8, holding its own against the rest to prove their worth. The Trojans’ best seasons are listed below. "SEPT 10,1966 AT RICHWOODS STADIUM THE TROJANS WON THEIR FIRST MIDSTATE 9 GAME EVER DEFEATING WOODRUFF 21-14 IN A TOUCH OF CLASS WOODRUFF COACH VIRGIL BOUCHER GOT ON OUR BUS AND SAID THIS IS THE FIRST OF MANY VICTORYS FOR YOU GUYS SAVOR IT FOR NOW AND GET READY FOR MANY MORE BERGAN WOULD GO 4-6 THAT YEAR THEN IN '67 UNDER COACH JIM HEID WE WERE 7-3 WITH GREAT WINS OVER MANUAL CENTRAL WOODRUFF LIMESTONE PEKIN DECATUR EISENHOUR & CHAMPAIGN CENTENNIAL OUR HEARTBREAK LOSSES WERE AT EAST PEORIA BY 7 RICHWOODS BY 1 AND OUR FINAL GAME AGAINST SPALDING IN A DRIVING RAINSTORM BY 7 WE WERE JUST 15 POINTS AWAY FROM AN UNDEFEATED SEASON." Bergan did have success on the tennis courts of central Illinois and won two district titles and placed a pair of teams into the top 10 at the state meet during the mid-1970’s. Unforunately, we are missing names of coaches and key performers that helped the Trojans have such a high finish. Please let us know if have this information. Bergan offered a chance for those who wished to grapple during the winter months. According to the IHSA website (www.ihsa.org), there is no record of any Trojan wrestler that placed at the state meet to medal. The 1973-74 team had the most success from a winning percentage standpoint, posting a 14-5 record. No other Bergan team finished above .500. The girls also got their kicks on the soccer pitch for Danny Driscoll, who would wind up as a successful coach at Peoria Notre Dame after Bergan merged with AOL/Spalding. His record with Bergan and Notre Dame combined for the girls was 184-67-19, with three regional titles, three sectional championships, three supersectional victories and as many trips to the state finals. He left Notre Dame in 1999. Bergan won a district and had several seasons of success under Coach Camargo. We’d like to find out more about the Lady Trojan volleyball program. If you have anything, please contact us at our addresses (see below). "In 1983, Bergan and Academy/Spalding joined forces to create a Boy's Hockey team, coached by Tim Staats. This team did compete against other schools, but in my time, did not advance beyond the Mid-State conference." Bergan High School also participated in girls softball. Coach Cathy Camargo led the charges in the early 1980s, however team recoreds and other coach's names are not currently available. "I am an alumnus from Bergan from the years 71’ to 75. There was a small swimming team in 1971, due to requests from several swimmers who had grown up in an era when children’s swimming teams and meets between 7 or 10 country clubs in the greater Peoria area were very popular (the sixties). I do not remember the name of the Christian Brother, (though I can picture his face) who acted as a coach, but we mainly borrowed the pool at Richwood’s High School, later using the swimming pool at the Hyatt Lodge where the old Vonachen’s Junction used to be, though that was not long lived, for practice. We did travel for meets and were pretty good. I was one of maybe three freshmen, with about 5 or so upperclassmen also in the team. Our star swimmer, a Junior, I believe, got in trouble for “smoking” - whatever substance that might have been -I do not know, (this was the early seventies, remember), but whatever it was, there was a BIG kerfluffle and he was kicked off the team by our coach.. There was no follow-up the next year, and since none of the Catholic schools had swimming pools, it never resumed." Bergan entered the state tournament for individual events in speech and had three people come away with state medals for competiting among the state's best durig the early 1980's. Bergan had a very active Fine Arts program. The school produced a play and a musical every year, had a band and chorus. The Illinois Theatre Festival is the largest, non-competetive high school theatre festival in the world. It was organized in 1976 by teachers from the Chicago suburbs. This festival is still going strong as they perform at the University of Illinois (Champaign-Urbana) and Illinois State University every other January. Bergan High school participated in this festival from 1977-80. "I had an all girl band played at lunch time are there any pictures. Marge student council was the base player Terry on drums me on cords electric We won battle of bands against other high schools. My all girl band played during lunch time with dimmed lights and dancing. We won a Battle of the Bands contest. Just can't remember if it was 65/66/67. We played at functions around town. Trying to track if anyone has a picture of our band."